I could never have imagined that touch could open up such a profound process in myself and now I have even learned to guide others in their process through giving touch, which is a magnificent experience." Many people experience tiredness as a result of constant muscle tension in their body. Muscle tension initially functioned as a protection mechanism to hold back anything that was unsafe to feel or express at the time. This holding of tension can become an unconscious habit that we may not even have an awareness of. We may believe this is just how we are. It can lead to stiffness, tension, pain or numbness in body and mind. This is a practical training to develop your capacity to sense, feel and be present with yourself and another in a creative and explorative way. Not only useful in the field of bodywork, but in life itself! A process of listening, accepting, connecting and receiving yourself and the client through touch. Anyone who would like to connect more deeply with their own body, feelings, and inner truth. Anyone who would like to to develop to a new level their own natural ability to give the gift of touch to others. Body workers who would like to deepen the skill of being able to read and follow a client’s subtle body expression moment by moment. 8 sessions received for your own process. This program will give you a strong foundation necessary to provide professional Touch & Awareness bodywork sessions. Combining soft touch and words to unlock aliveness. Experience different intentions in touch, direction of pressure and how to touch different body parts. Body reading, seeing the potential for more natural movements and locating where the blockages are. Learn to listen to signals in the natural breath and follow the shifts as a guide for how and where to touch. Grounding exercises to let go of trauma related stress. How to be present when emotions arise in the client. Integration of your own process and learnings through sharing, meditation and movement. Students’ last day of the group training in 2018. Celebration! About the founder and facilitator: Schirin started her training in Rosen method bodywork in 1996. She has been a practitioner since 2001 and a supervisor. Also educated in Thaivedic massage and as a tantric bodyworker. Her passion is to get in Touch with what is happening in the present moment. 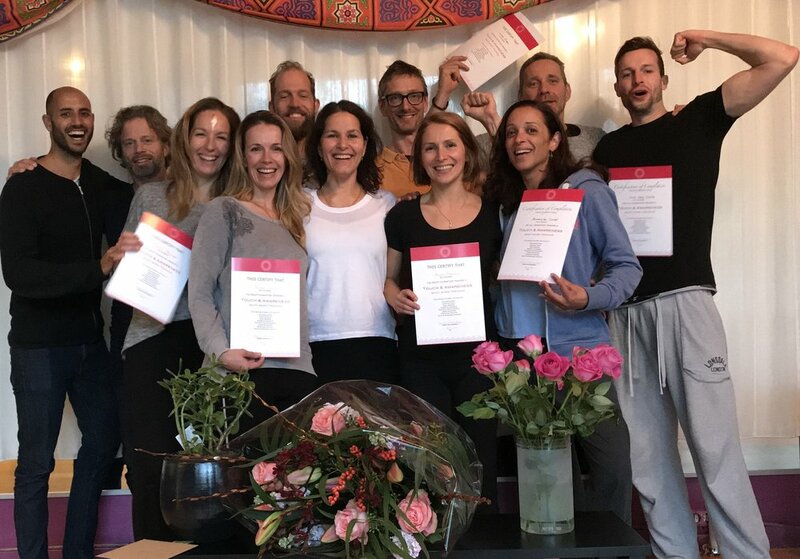 Amsterdam 2018 saw the first edition of her Touch & Awareness bodywork training; bringing together a blend of all her deep experience.